Bureau of Criminal Investigation (BCI) special agent Seth Hagaman (left) takes the stand during the Bret Merrick hearing. Also pictured is Judge Stephen Wolaver and court reporter Julie Hohenstein. 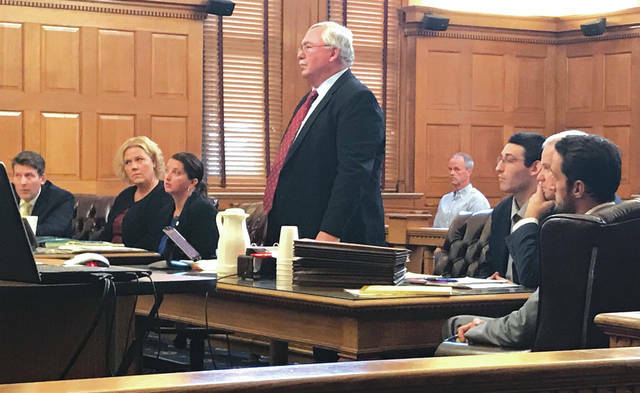 Anna Bolton | Greene County News Assistant prosecutor David Hayes (left), Detective Kelly Edwards, assistant prosecutor Cheri Stout, defense attorney Dennis Lieberman, defendant Bret Merrick and defense counsel listen to Judge Stephen Wolaver during a hearing Sept. 13. XENIA — Judge Stephen Wolaver will decide whether or not certain statements made during an interview will be allowed as evidence or suppressed in a case pertaining to the Yellow Springs double homicide. 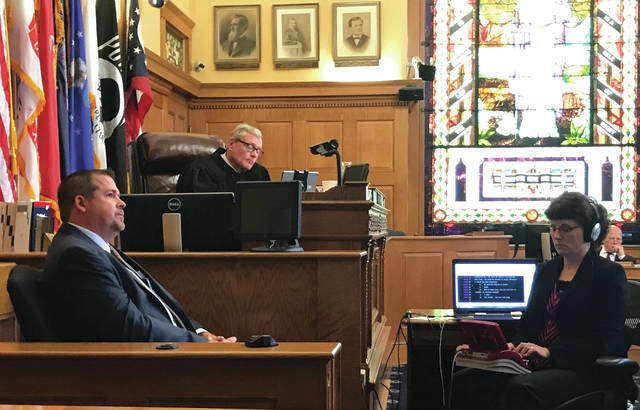 A video of the six-hour-long interview between Bret Merrick and law enforcement officials was discussed in a hearing Sept. 13 in Greene County Common Pleas Court. The interview was conducted by Bureau of Criminal Investigation (BCI) special agents and a Greene County Sheriff’s detective at the Xenia Police Department nine days after the murders took place. Bret Merrick, 24, is accused in the Jan. 15 murders of William “Skip” Brown and Sherri Mendenhall of Yellow Springs. He and his brother Dustin Merrick, 26, were indicted on various charges, including aggravated murder, and are facing the death penalty. Bret Merrick’s attorney, Dennis Lieberman, filed a motion to suppress evidence, claiming his client’s rights had been violated during the interview. Lieberman stated that the major issue was that a Miranda warning was not given to Merrick until one hour and 45 minutes into the interview. BCI special agent Seth Hagaman, who initiated the interview, testified that he did not read Merrick his rights because he originally viewed him as a witness rather than a suspect. He also said that the interview took place because Dustin Merrick named his brother as his alibi. Hagaman said the interview was casual, that Merrick was articulate and cooperative and said he wanted to help. Hagaman said he thought of Merrick as a witness who was just trying to protect his brother. “I was trying to get him to not ruin his life over protecting his brother because at that point I didn’t think he was involved with the murder,” Hagaman said, in response to his line of questioning. BCI special agent David Hornyak allegedly took over the interview after Hagaman and read Merrick his Miranda rights. Hornyak said Merrick gave verbal consent in response. The defense told the judge they wanted to make sure the defendant waived his right affirmatively, knowingly and intelligently. According to the state, represented by assistant prosecutors Cheri Stout and David Hayes, the entirety of the interview and all of Merrick’s statements were voluntary and that the reading of Miranda rights was not required. Hornyak described the interview as primarily conversational, although admitted he used verbal tactics to obtain the truth from Merrick. He said Merrick changed his story more than once. Merrick — who allegedly was never threatened, handcuffed, or forced to stay during the interview — was placed under arrest when the interview ceased. At the same time that Bret Merrick was being interviewed at the Xenia Police Department, authorities were serving a search warrant at Dustin Merrick’s Xenia home. A motion to suppress evidence hearing was held in July for the older Merrick, whose case is being handled by Judge Michael Buckwalter. The Merricks are currently being held in the Greene County Jail on a $5 million bond. According to online court records, a jury trial for Bret Merrick has been scheduled for Monday, March 19 through Friday, April 6. His brother’s is currently set for Monday, Nov. 6.
https://www.fairborndailyherald.com/wp-content/uploads/sites/50/2017/09/web1_Hagaman.jpgBureau of Criminal Investigation (BCI) special agent Seth Hagaman (left) takes the stand during the Bret Merrick hearing. Also pictured is Judge Stephen Wolaver and court reporter Julie Hohenstein. https://www.fairborndailyherald.com/wp-content/uploads/sites/50/2017/09/web1_Lieberman.jpgAnna Bolton | Greene County News Assistant prosecutor David Hayes (left), Detective Kelly Edwards, assistant prosecutor Cheri Stout, defense attorney Dennis Lieberman, defendant Bret Merrick and defense counsel listen to Judge Stephen Wolaver during a hearing Sept. 13. Contact Anna Bolton at 937-502-4498.